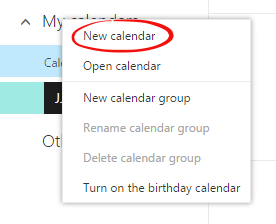 You can create multiple calendars in Outlook. This allows you to separate personal events from work events, and you can designate one calendar for sharing. Step 1:Open Outlook to your Calendar. 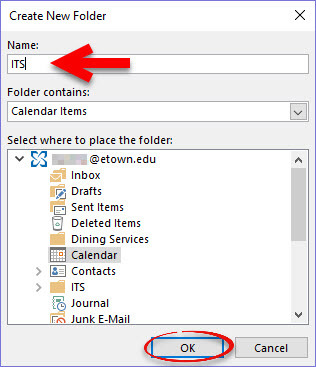 Step 2:Click the Folder tab and select New Calendar. Step 3:Enter a name for the new calendar. 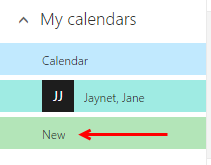 Outlook will automatically create the Calendar items. SMake sure the folder is with your other Calendars. Click OK. Step 4:The new calendar will be listed under My Calendars. Place a check next to the name to view it. You may add your events and share the calendar. Step 1:Click the square in the top left hand corner and select Calendar. Right click on My Calendar in the left menu and select New calendar. Type the name of the new calendar you would like to create, then press the [Enter] key or click in an empty space to save the name. Click the calendar name to highlight it and display that calendar. You can select more than one calendar to view at the same time. When creating a new event, don't forget to select the specific calendar you would like to add the event to.